"Rev-up your game day appetite with this low-prep Motor City Coney Dip. Start by browning lean ground beef in a large skillet. Then, stir in McCormick® Sloppy Joes Seasoning Mix and Kitchen Basics® Beef Stock with tomato juice, yellow mustard and onions. 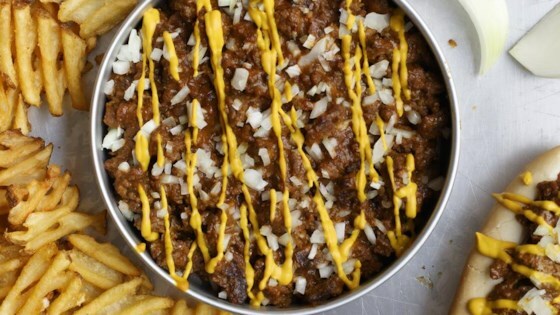 Serve with waffle fries and enjoy exciting Sloppy Joe flavor in every bite!" Brown ground beef in large skillet on medium-high heat. Drain fat. Stir in Seasoning Mix, stock, tomato juice and mustard. Bring to boil. Reduce heat and simmer 20 minutes, stirring occasionally. Sprinkle with onion. Serve with waffle fries.